I built this mainly for CCC, but it fits here too for a free build! Jesters aren't as appreciated in the far north as they are in the warmer Guilds. 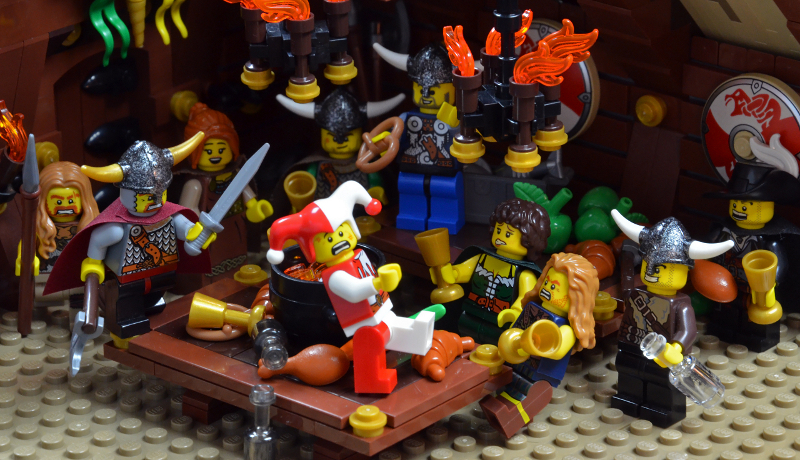 In fact, Erik the Angry appreciates jesters so little that he typically runs them right out of his clan's village--an event that is usually incredibly entertaining for the bystanders; but, not so much for the jester. Thanks Gunman! I intended this to be a mead hall or long house or something 'viking-y' like that. Ha, ha, good to see he has a sense of humor. This definitely gives off a Viking-like vibe. Great work! Erik the Angry? Nah, zero sense of humor there! Thanks man! I was hoping all those horned helmets would help. Nice MOC! I feel sorry for the jester! The walls and door are excellent and fit right in with the Norse style I also like how you built the rafters and gave us a glimpse of the bottom side of the roof. UoP DoH +1 for all credits claimed. Thanks SK, I was thinking about claiming DoH credit for the roof, but I went with village life instead. A lot of action and interesting details, good job! Anyway, UoP +1 for those categories. Agreed. However, I was at a complete loss with respect to what to do with it. I certainly didn't want to tile the floor--it's not a castle throne room interior--but, the studs are kind of distracting with the rest of the build studless. I love the nervous expression on the right woman's face in contrast to the fellow next to her who looks like he is going in for an offhand smash with the chalice, great posing throughout. As to Gideon's comment I think you could have used a sideways snot floor mostly in brown with a few dark tan and dark grey plates thrown in to represent stray thatch and mud. Still simple but it gets rid of the studs. Your scene is so complex, however, that you barely notice there is a floor, so a very minor issue, great work overall. Very lively scene, love all the action taking place. Cool stuff! This is such a great scene, full of life, humour and drama, and the background suits it perfectly. The regular studded floor is a little distracting from the surrounding level of detail i agree, although i think keeping the floor a lighter colour was a good choice. Maybe some scattered tan boat studs and 1x1 rounds would help break it up a bit maybe? Anyway, not sure if you have enough UoP votes yet, but +1 to 'em all anyways! I love the nervous expression on the right woman's face in contrast to the fellow next to her who looks like he is going in for an offhand smash with the chalice, great posing throughout. As to Gideon's comment I think you could have used a sideways snot floor mostly in brown with a few dark tan and dark grey plates thrown in to represent stray thatch and mud. [...] great work overall. Thanks Gabe! (You're #4 for UoP here I'll go mark it off on the Registrar's thread. Definitely been trying to keep that up to date for you guys.) One question though, what are "boat studs"? Boat studs, better known as Plate round 2x2 with rounded bottom . So called as they are often put on the bottom of ship sets so you can zoom them around on the carpet.